I was busy reading the paper when I heard Master moving boxes in her office. Curious, I peeked inside her office and I saw Master turning her book shelves upside down. It seems that she was looking for one of her old college books and it's nowhere to be found. I quickly jumped in to help Master look for her old college book. I used her step stool to look for it behind the storage boxes but there was nothing behind the boxes. Master has so many books so I'm not surprised she can't find the one she was looking for. Master no longer uses her college books but she still likes to keep them in her office. Maybe she can sell some of her books to ValoreBooks.com. It is the student's #1 marketplace to buy cheap textbooks for college and to sell used textbooks back. ValoreBooks.com offers the best prices online for students looking to buy cheaper used textbooks. There is an online sell back program, which students can use to sell their textbooks once the semester is over so it's really a handy site. It took Master the whole afternoon but she finally found the book she was looking for. I was so tired by then and fell asleep at my favorite spot. Good night! haha.. pheebs.. you're so smart .. you can read the newspaper upside down.. lol!! and so helpful lagi.. no wonder your master loves you sooo much!!! Recent blog:=- Debt Management Works! meow meow working hard with PBs it seems! Recent blog:=- Weblog Popular 1Malaysia :Does Your Blog Have What It Takes To Win RM1000? hahahahha how abt woafs and mpg? 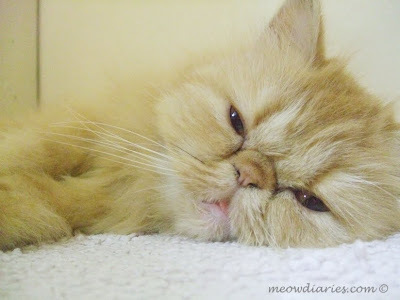 Rizal, sempat cakap nite nite kat Pheebs he he! Aha, Marzie, this is funny. Cute. 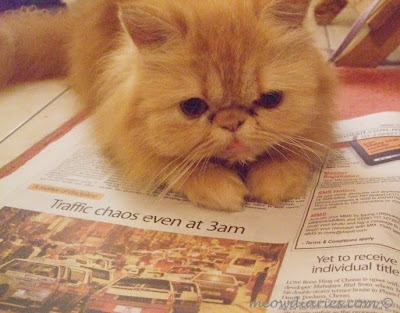 Phoebe was reading newspaper checking out the traffic for Master. I am sure Phoebe wanted Master to have a smooth ride going to Bazaar. Smooth ride, Bazaar Ramadhan, Happy satisfied Master, probably some goodies for Phoebe. :-D I think maybe that was on Phoebe's mind. MPG nothing this month Mon, so sad! I have one more to do for WOAFS from SR and then no more PBs for real! You? Oh no!! Phoebe was busy digging some research for Master Paid Post. Ho Ho Ho. I Like it. Hugsy MPG! I've 2 PBs; one from RM another one LW! yeah these few days like nothing to chop...0! Silly RM not giving us PBs ROTFLMAO! Oh my gosh! Look at that face!! It is just the cutest!! I could look at that face all day!! Well, no, I would have to hug and squeeze that precious kitty too!! hey i just chopped one RM PB and one LW PB! go check yrs!! Yeah lorrrr just simply bid and then got it seems, have u been bidding there? I hardly login too but they send me email notifications when there’s a new opps so I usually bid if got interesting ones he he… try la! they told u they dont like it is it?? ohhhh hahahhahahah!! okok i got it! ohhh so this one is SR PB? u mean big one just for 50 words? yeah u wrote more than 50! :-D wahhh so good huh big PB some more!!!! another 4 PBs oso from SR kah? Got one more at RM for me to chop but I think I’ll pass…. Same topic la as the one I chopped earlier..
why abt gaming is it? LOL no abt web hosting…I chopped 2 edi, one for woafs and one for meows, takkan la wan to chop again right? LOL!!! later my readers oso fed up LOL!! Remember I told u abt this opp? I oso don know what oral chelation is all about and lazy to find out he he he! ohhh and now increase price edi huh! LOL! Yeah enticing me it seems Mon hahhaaha 20 bucks! hahahah chop first lah if u don like no need to write oso no prob right?? u mean the oral something?? The oral something? Hahahhaha! Me not taking the oral PB lol! Some more taking abt it at two diff blogs, me oso confused! hahahahhhhaha yakah? we talked abt it at two diff blogs? LOL!!!! !